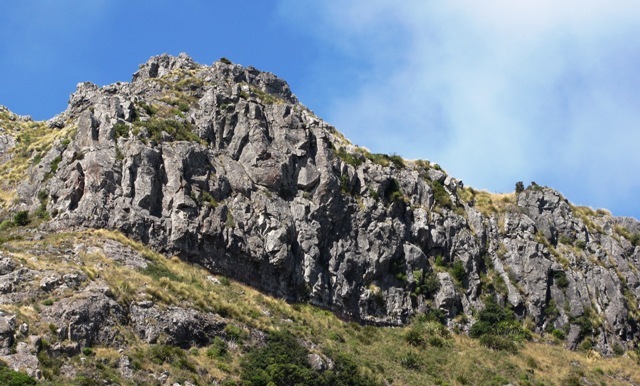 An impressive wall, above Akaroa. Drive uphill for about 3km. Park by the road walk uphill to the crag. on the same hieght as Brasenose but further right. At the LH end and up is a small face with a R-L trending elbow crack.Gain the crack at the elbow and follow. Climb the skyline block/face initially in the middle, then the L edge. A few metres R. Up the wide zig-zag crack , move R to avoid summit block and finish up a series of corners. 5m to the R. Up the blocky groove and short steep corner Move L at bushes, any way to top. Climbs the next corner some 5m to the R (NOT the big corner!) Start between these 2 corners and up a crack to the slab below large triangular OH at 10m. Move L and up corner past shrub. Move up and R along flake (crux). Start as for NRFTW, but continue directlty up past a flake and ramp to a short steep crux up final corner. Climb up to the first bolt on “No Rest For The Wicked”, traverse right to the arête and the second bolt. Clip the bolt and move round right to climb the bulge. Move up to the second roof, clip the bolt on the lip round right to climb the bulge, continue straight up a steep red groove step slightly right at the top. Up again to the final bolt on top of a pedestal before finishing easily up to a single bolt belay. 20m R of SC. Climb through square notch to the L of the overhang. Traverse R-wards to the reverse C, wide crack then R-wards to the rib. Climb past the orange face finishing up a corner with a white spot on the L, on easier but less protected climbing. The line of 5B to the R of the overhang. Start just by a hanging garden 2m of the ground. Step R at the flax, follow groove and crack past bolt on L. Move R to belay below overhang R of the tree. Move up L-wards past 2B finishing up the corner. AS for IOYO. 1.Start just by a hanging garden 2m of the ground. Step R at the flax, follow groove and crack past bolt on L. Move R to belay below overhang R of the tree. Continue directly through small roof past 4B. Climb the bolted groovr to the R of the ledge. Go L-wards past a small roof at the 5th bolt.. Carry on over the next overlap to good pro then through the 2nd overlapand flake face.